Asphalt comes indoors | Will You Miss Me When I'm Gone? 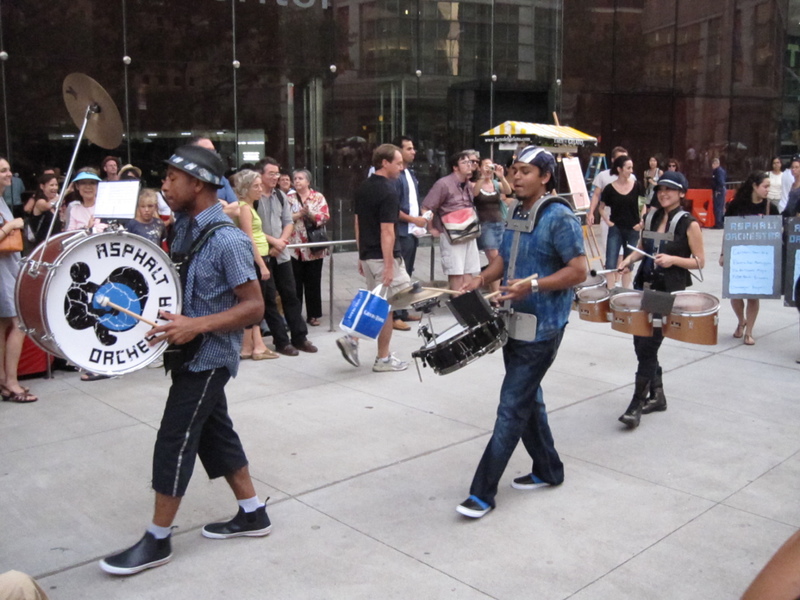 Asphalt Orchestra, my very favorite avant-garde marching band — okay, I admit, it’s the only avant-garde marching band I know — high-steps it indoors tonight at Lincoln Center for a free show. “We’re playing everything we’ve ever played — plus two new arrangements,” promises Asphalt saxophonist Ken Thomson.That means music by Frank Zappa, Meshuggah, Bjork, Tom Ze, Thomas Mapfumo, Stew and Heidi Rodewald, Goran Bregovic, Tyondai Braxton (of Battles), Charles Mingus and Conlon Nancarrow. Whew! 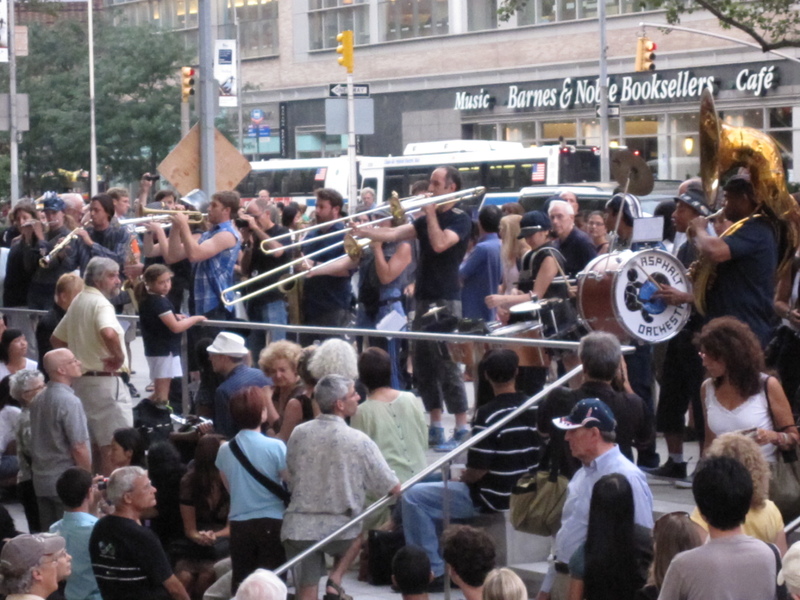 This is the only show the band — created by Bang on a Can for last summer’s the Lincoln Center Out of Doors Festiva — will be doing in NYC until the summer. And, while Asphalt is probably best seen and heard outdoors, marching up and down bleachers and wandering around the Lincoln Center campus, it’s a big plus that tonight’s show is indoors! The show is scheduled to begin at 8:30 tonight in David Rubenstein Atrium at Lincoln Center, on Broadway between West 62nd and West 63rd streets, just east of the Plaza in the former Harmony Atrium space. It’s a perfect gateway to the arts center, with visitor information on all Lincoln Center tenants, a ticket office offering day-of-performance discounts, a performance space, a restaurant, free WiFi and restrooms. Arrive early to get a good seat, as it’s first-come, first-served. For my part, I’m thinking about standing, just to remind me of my first experiences with Asphalt. Asphalt Orchestra playing the world premiere performance of Stew and Heidi Rodewald's "Carlton." This entry was posted in Contemporary, Contemporary Classical, Music, News, Pop and Rock, Punk and tagged Asphalt Orchestra, David Rubenstein Atrium, Ken Thomson, Lincoln Center Out of Doors. Bookmark the permalink.